Client: Valard Construction Ltd., Northstar Services Inc., and Sharp’s Construction Services. The ATCO Electric EATL project is a 500 kV electric transmission line project in eastern Alberta, Canada. The entire transmission line alignment is approximately 485 km (300 miles) long, starting from an area northeast of Edmonton, near Redwater, traversing south and ending near the Town of Brooks. The transmission towers consist of lattice steel structures. There are approximately 1,500 towers for the project. The four tower legs were supported by either; driven steel piles, bored cast-in-place caissons or grillage foundations. Over half of these towers were supported on driven steel pipe pile foundations with between 12 and 64 piles per tower. 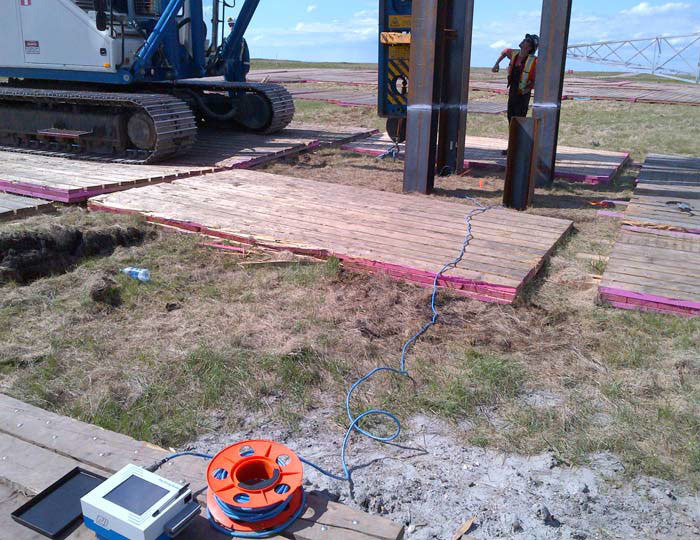 ParklandGEO performed pre-construction activities which included static load testing and test pile programs with additional dynamic load (PDA) testing. Individual driven steel piles, one pile group and one large diameter concrete caisson were tested for axial compression, tension (individual and group), lateral resistance, vibration and noise. The caissons were further tested for pile integrity and subsurface profile using a thermal imaging method. During construction ParklandGEO engineers provided pre-driving WEAP analysis for driven steel pile sites to set final termination criteria. Field services provided by ParklandGEO technicians and engineers included: pile inspection (driven steel and cast-in-place caissions), PDA testing, vibration & noise monitoring, concrete testing, compaction control, aggregate & fill acceptance testing and pile integrity testing (PIT). To date, PDA testing has been performed on over 820 tower sites. Supporting office services include management of all test data; as well as capacity approval and preparation of final turnover packages for all driven steel tower sites.